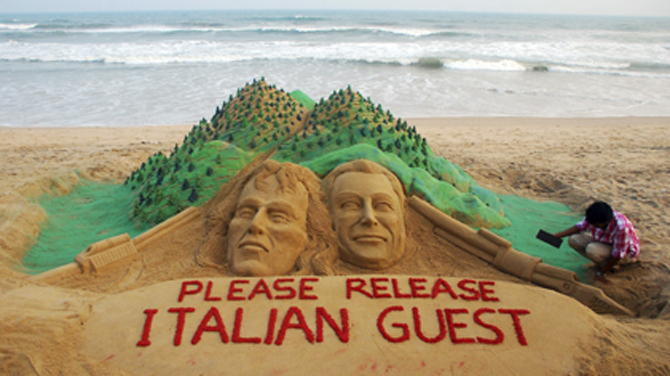 BHUBANESHWAR, India—A Maoist leader offered on Wednesday to free one of two Italians abducted a week ago in eastern India if officials agree to release a group of imprisoned rebels. In an audio recording distributed to the media, Maoist leader Sabyasachi Panda said his forces would release one of the two men if the Orissa state government frees rebels who led strikes and protests in local factories. Police re-arrested the group after a court found them innocent of committing crimes against the state. Panda did not indicate which of the Italians would be released. There was no immediate government response to his offer. It was the third audio tape he has released since the abduction. Talks to free the men have been delayed by disagreements over the choice of negotiators, Orissa's chief minister said. The rebels have also warned that they would hand the hostages over to guerrillas in a neighboring state if Orissa's government does not end security operations against the Maoists and free detained rebels by Thursday. The Italians — Orissa tour operator Paolo Bosusco, 54, and tourist Claudio Colangelo, 61—were abducted on March 14 while on a trek through a densely forested area of Orissa. The Indian cook and driver they were with were released by the rebels the same day. The two sides have agreed to begin talks as soon as they agree on negotiators, but Orissa Chief Minister Naveen Patnaik said one of the people proposed by the rebels was unacceptable because he had been convicted of serious crimes. Another person refused to act as a negotiator. The rebels haven't said if they would accept the three officials named by the government as its representatives. Police in Orissa say the rebels are most likely holding the men in hideouts deep in the jungles of the state's Kandamal district. The government on Monday stopped all security operations in that district—another earlier rebel demand in return for the men's release. The rebels, inspired by Chinese revolutionary leader Mao Zedong, have been fighting in several Indian states for more than four decades demanding land and jobs for farmers and the poor. Prime Minister Manmohan Singh has called the insurgency India's biggest internal security threat. At least 2,000 police, militants, rebels and civilians have been killed in the conflict.